When I was about seven or eight, I watched The Parent Trap II with my brother and our cousins. The storyline isn’t that important (best friends want their single parents to marry, and — coincidence? — one of those parents is a twin played by Hayley Mills) but what stuck with me for some reason was a scene early on in the movie where the two young girls bake cookies. They had a huge mixing bowl on a kitchen countertop, and the two kept on throwing in what seemed to me to be the craziest ingredients into their dough: marshmallows! Cap’n Crunch! M&Ms! pretzels! Then the girls formed their cookies and put them in the oven, and all I could think was, Gross. I really think that that movie is what turned me off of baking. Interestingly enough, it didn’t turn me off of cookies. I like coconut, I really do, but its cuticleness just drives me bananas. I think that’s why I’m so surprised that I adore these cookies as much as I do. The trick, with these not-overwhelmingly-sweet cookies, is toasting the cuticle out of the coconut and amping up the richness of its natural flavor. As a result, you get these little soft bites of truly intense coconuttiness — which just so happens to pair quite nicely with a luxe dark chocolate, I might add. Have these cookies changed my mind about coconut? Perhaps not. But they’ve definitely got me thinking about coconut a bit more, and with something like a smile on my face. “I’ve Got a Lovely Bunch of Coconuts” was originally recorded by Merv Griffith, but I’ve had a huge fondness for Danny Kaye since childhood, and since he was a huge lover of food, I went with his version. Normally I don’t like to make anything from a recipe that requires special equipment. I only have so much space in my kitchen cabinets, after all, so where am I going to store a pasta machine, panini press, a yogurt maker, a slow cooker, an espresso machine, a meat grinder, an electric slicer or a deep fryer? * I’m not exactly Ina Garten, with my own barn in the backyard specifically for cooking, baking and entertaining — no matter how appealing such a barn sounds. I’m all for a room of one’s own. And now I’ve gotten off topic. The exception I’ll make to my so-called rule, though, is the madeleine tray. They stack right up, taking up practically no space, and it’s so easy to find an inexpensive mold that buying them in triplicate won’t break the bank. Think of it this way: you’ll get reimbursed in flavor. The intense citrus of these little cakes can’t be denied. Traditional madeleines are made with lemon; each bite will also bring you the distinct luxury felt only when eating something baked with a lot of butter. Still, butter or no, as any Proust fan knows, having a madeleine is revelatory. I’ve tried a few different recipes, and the one I’ve had the most repeat success with is David Lebovitz‘s, so when I got the idea in my head to make an orange-y madeleine, I didn’t want to mess with perfection. Instead I went with a simpler recipe, but I decided to whip up an orange version of David’s lemon glaze to make my cakes as orange-y as possible. Preheat oven to 375°. Generously butter and flour large madeleine pan. Using electric mixer, beat eggs and sugar in large bowl just to blend. Beat in vanilla, orange zest and salt. Add flour; beat just until blended. Gradually add cooled melted butter in steady stream, beating just until blended. Spoon 1 teaspoon batter into each indentation in pan. Bake until puffed and brown, about 12-14 minutes. Cool 5 minutes. Gently remove from pans. Stir together ingredients until smooth. Dip each cookie into glaze and let rest on cool cookie sheet or cooling rack until glaze becomes firm. * You’ll notice I left out an ice cream maker. That’s because I’m certain I can squeeze one into a cupboard somewhere. A Mid-Afternoon Cold Weather Snack. I’m not an optimist at heart, so when I complain of the cold and someone says something to me like “Believe it or not, spring is just around the corner,” it does not make me feel any better about my not-quite-waterproof boots and feather-leaking down jacket. Seriously, whenever I take it off white feathers explode out of it, covering me in fluff — not chic. But it is warm. Anyway, my point is this: it is winter, so just deal with it. Sorry for being so grumpy. I’m trying very hard to smilingly follow my cold-weather mantra but it’s difficult to do so when, while disembarking from the bus, I have no other choice but to step into a thigh-high snowbank, which is what I did on Monday. But, as I waded my way out, I grimly grinned — winter isn’t going to get the best of me. In fact, I’m going to take advantage of the freezing temperatures by making a batch of cookies perfect for snacking on the sofa with a blanket. I’m a sucker for sugar cookies, but what I had in mind was something with a little more of a tang and a lot less sweetness. I had fooled around with an anise biscotti recipe not too long ago; the flavor was nice, but I’ve never been terribly fond of biscotti’s tooth-crushing crunch — dentists must make a fortune off of biscotti enthusiasts, don’t you think? After pondering for a while, I decided lemon and anise would make a good combination; the citrus and licorice flavors wouldn’t be overly sugary, and besides, I already had a tried-and-true lemony cookie recipe that would be able to stand up to some tweaking. With some experimentation, and after eating a lot of dough, I found the ideal balance of lemon and licorice — though I should tell you that I do prefer food (and cookies) on the more lemony side of the spectrum. All I can do is advise you to taste your dough along the way and add more or less flavoring as you see fit. Just make sure that when the cookies are done you take a few to your favorite spot on the couch, along with a cup of tea and your warmest quilt. Then you’ll be ready to wait out the winter ’til spring. Makes about 20 3-inch cookies. Preheat oven to 350°. Sift flour, baking soda, and salt into a bowl; set aside. Put sugars and lemon zest in the bowl of an electric mixer fitted with the paddle attachment. Mix on medium speed 30 seconds. Add butter; mix until pale and fluffy, about 1 minute. Mix in eggs, 1 at a time, and then the lemon juice and fennel seed. Reduce speed; gradually add flour mixture, and mix until just combined. Scoop dough using a 2-inch ice cream scoop; space cookies 2 inches apart on parchment-lined baking sheets. Flatten cookies with a spatula or bottom of a drinking glass. Bake cookies until golden, about 15 minutes. Let cool on sheets on wire racks for 5 minutes. Transfer cookies to racks and let cool completely. Cookies can be stored in an airtight container at room temperature up to 3 days. It’s funny because I never really used to be into baking; cooking was always much more interesting to me, and frankly, baking always seemed so girly. That said, I’ve recently taken up baking, though I don’t do it that often. I definitely cook more, probably four to five times a week, depending on the leftovers situation. I’ll bake when the mood strikes me, or when I’ve got a craving, which is something like twice a month. I definitely bake more around the holidays — everyone gets cookies. I also bake for Keith more than I bake for me. I’m nice that way. I’m easy, man. It’s my wooden spoon. I wish I had a few more of them. I use it to mix just about anything, and I love the way it feels in my hand. Actually, now that I’m thinking about it a bit, I think I would say my chef’s knife instead. I’ve used some awful knives in my day, the kinds that coerce an onion apart as opposed to chop it, and having a good solid knife makes all the difference. In fact, if you’ve got one good knife — one really good one — you don’t need any more. Having lived in many an apartment without one, I’ve got to say my dishwasher. You know, I used to buy glasses based solely on whether or not I could fit my hand and a sponge down its mouth? Now I can purchase any style that catches my eye, and that feels great. I like glasses. I also like the area that I call “the in-between” or “the pass-through.” It connects the kitchen to the dining room, and we have it cabinet-ed out. The bottom portion functions as a snack pantry of sorts, as well as storage for platters and my massive stand mixer. Half of the upper cabinetry is devoted to storing Keith’s whisky collection; the other half holds my cooking magazines and cookbooks. Come to think of it, this is a tricky question for me to answer; we renovated the kitchen to best suit our needs and our aesthetic (on a budget). There are so many aspects of this room that I love, like the countertops that look like oxidized metal, the unusual color of our cabinets, the soffits, the ceiling fan, my knife strip… It would be the equivalent of asking me to pick my favorite dog, if I had lots of dogs. Or any dogs. Or a dog. The leftovers lasted for days. Dinner, Dessert + More Gossip Girl. The thing about a show like Gossip Girl is that once you start watching, it’s impossible to stop. I suppose the series is a bit like Pringles that way, but with leagues more manipulation and making out. Darlington and I were two discs deep into season one when we decided a midweek mini-marathon was in order. It had been something like seven days since we had last snuggled up with Serena, Jenny and Dan — and that was seven days too many. It’s way too easy to sit lumpishly on the sofa with a bag a of chips (or a tube of Pringles, for that matter) and bask in Gossip Girl‘s glow, so Darlington and I decided that a more wholesome dinner was in order. I knew just the meal that could satisfy us on both a taste and health level: a mix of roasted carrots and cauliflower served with couscous, chickpeas and greens. The salad is as delicious to eat as it is a breeze to make; the most trying part of its preparation is in peeling the carrots. After that, it’s pretty much just a matter of waiting while the vegetables roast. Speaking of roasting, what is it about applied heat that deepens the flavor of carrots and intensifies the cauliflower? Come to think of it — I don’t know if I even care about the science behind my question. All I know is that the end result is incredible. Nutritious nosh aside, neither Darlington nor I are delusional; we each have a wickedly strong sweet tooth. That said, we didn’t want to completely wreck the integrity of our meal with something completely as decadent as a chocolate cake. What we could do, on the other hand, was supplement our evening with a batch of relatively healthy cookies. “They’re called ‘Wheels of Steel,'” Darlington said excitedly, as I raised the most skeptical eyebrow. My wariness stayed firmly in place even as Darlington told me that her mother used to bake these cookies years ago; the original recipe is from Feed Me, I’m Yours, the iconic 1974 child-friendly cookbook. Preheat oven to 450°. Place carrots and cauliflower on a rimmed baking sheet; toss with cumin and two tablespoons oil. Season with salt and pepper. Spread half the vegetables on a second baking sheet. Roast until browned and tender, twenty-five to thirty minutes, rotating sheets and tossing halfway through. Cool to room temperature. Meanwhile, in a medium saucepan, bring 1 ¼ cups salted water to a boil. Stir in couscous; cover and remove from heat. Let stand until tender, five minutes. Fluff with a fork; set aside to cool, uncovered. Make dressing: In a small bowl, whisk together lemon zest and juice and remaining tablespoon oil; season with salt and pepper. In a large bowl, combine roasted vegetables with couscous, chickpeas, and scallions. Place arugula on a serving platter, and drizzle with one tablespoon dressing. Add remaining dressing to couscous mixture, and toss; serve over greens. Preheat oven to 375°. With a hand mixer, cream butter with sugar until smooth. Add peanut butter, egg and vanilla; beat well. In separate bowl combine flour, wheat germ, dry milk, baking powder and baking soda. Add the dry ingredients to the wet; stir well. Stir in milk, oats and raisins. When thoroughly combined, place heaping spoonfuls of dough onto a greased cookie sheet; be sure to leave an inch or more between cookies. Sprinkle with sesame seeds. Bake for ten to twelve minutes. Allow cookies to cool completely before removing from sheets; they are very fragile while warm. Last week, I sent my friend Ben in LA a box of cookies. I had baked a ridiculous amount of several different types: chocolate cherry chip, madeleines, hazelnut-anise, olive oil and, of course, Medz Mama’s cookies. Since I knew Ben wouldn’t mind eating my leftovers, I packed up a sampler and headed to the post office. When he got the cookies, Ben phoned to say thanks and we had a nice little chat, so I was surprised to get another call a few days later, after he had tried each one. When I heard that, I felt a thrill; what a nice compliment! Once I had thought about it more, however, my excitement quickly faded. After all, I hadn’t invented the cookie recipes, nor had I put my own twist on them. With the exception of Medz Mama’s cookies, I had pulled my miscellaneous cookbooks out of their cupboard (and in the cases of the olive oil cookies and the madeleines, I had gone to Mark Bittman and Heidi Swanson respectively) and dutifully followed the instructions to the letter. The result was an abundance of homemade cookies, to be sure. But should I have truly received the credit for making them? If you just follow recipes, you’re not teaching yourself how to cook. Once you understand technique — how to roast something, how to braise, how to sauté properly — you won’t need recipes anymore. You can start cooking your own food. 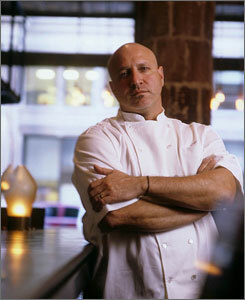 Is Colicchio right? Can you not learn how to cook by reading and trying recipes? Obviously, you need a basic sort of understanding when it comes to the fundamentals, and I know I can thank my mother for teaching me that. That said, is what Colicchio is describing the craft of cooking, or the art? To me, running alongside a recipe shows the understanding of the craft, while inventing a unique recipe is the sign of art. When it comes to cooking, I most certainly lack the artistry. I’ve never claimed to be a good cook; if anything, I’ve claimed to be able to follow a recipe really well. This past Easter, I served two entrées and four side dishes that I had never made before, as well as a whole string of desserts whose recipes seemed interesting; I’m pleased to report that everything ended up tasting exactly as intended. That doesn’t mean that there aren’t items that cause me to lose culinary confidence, because I’m nervous about roasting a whole bird and I find the idea of using yeast a bit terrifying. (At least I’m not alone.) But does this mean I don’t know how to cook? This past Sunday I had book club over for brunch; at the last minute I decided to bake scones, which I hadn’t ever done before. Since I didn’t have my cookbooks handy when I made up my mind, I turned to Google and found a recipe. The result was so lovely that I baked a second batch immediately after my friends had left. Here’s a photo of the wet ingredients meeting the dry, which I snapped because the cranberries simply looked so pretty, with the white cream puddling in their little crinkly wrinkles. If the delicious product I turned out of this bowl means that I can’t cook (or bake), then that’s fine by me.